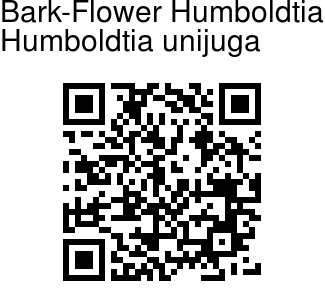 Bark-Flower Humboldtia is a tree up to 6 m tall. Branchlets are round, hairless. Leaves are compound, bifoliolate, alternate, distichous; axis short, 0.5 cm long with obovate gland like structure above; stipules in pairs, persistent, leaf-like, lanceshaped; leaflets nearly stalkless, blade 7-15 x 2-5 cm, lanceshaped, tip tapering, base oblique; midrib raised above; secondary_nerves 6-9 pairs; tertiary_nerves reticulo-percurrent. 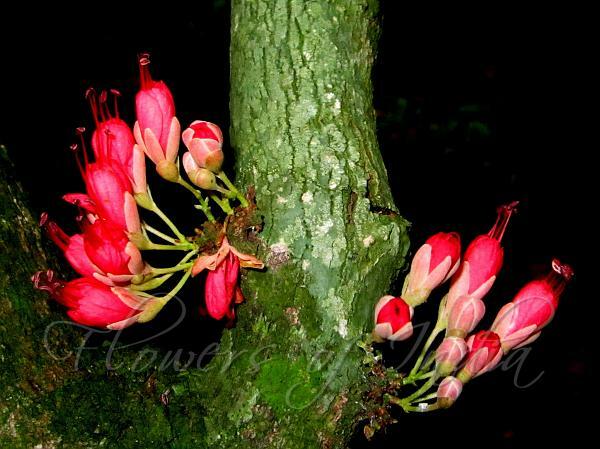 Flowers are borne in fascicled racemes on main trunk or in leaf-axils from leafy branchlets. Flowers bisexual, 1.5-2.5 cm long, crimson, in in leaf-axils as well as cauliflorus racemes; sterile bracts present at the base of racemes; flower-cluster-stalk velvet-hairy; flower-stalk 5-10 mm long, finely brown velvet-hairy; bracts fringed with hairs, velvet-hairy without; bracteoles 2, 4-5 x 1.5-2 mm, ovate, rounded at tip; calyx tube 8 mm long, obconical lined by the disc, lobes 4, velvet-hairy, obovate, rounded at tip; petals 5, 10-15 mm long, obovate, crimson, narrowed at base, veined, hairless; stamens 5, free, filaments 1 cm long, thread-like. Fruit a pod 5-8 x 2-3 cm, compressed, oblong, deep red, veined; seeds 2-3. Bark-Flower Humboldtia is found in Southern Western Ghats. Flowering: December-March.